Available February 1st, this unit in a three-story building is situated on a peaceful street corner near several green spaces. 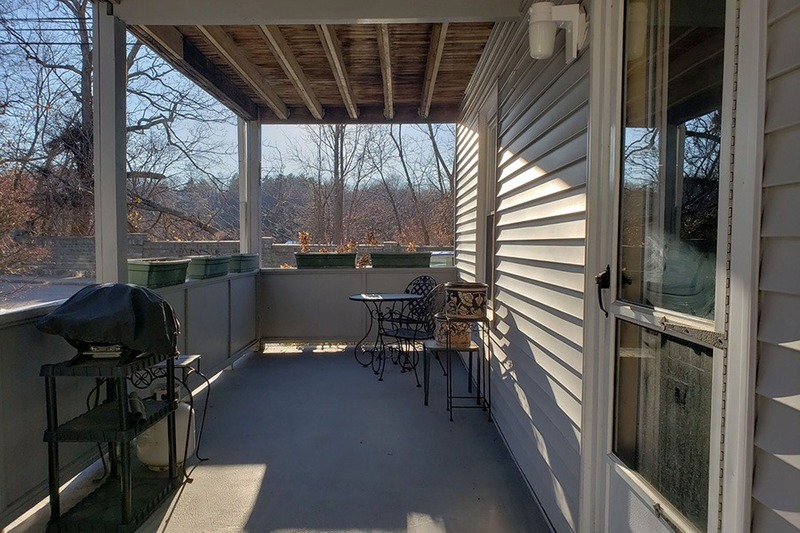 A private deck is accessible through the back door, and is large enough for a grill, dining set, plus a few friends. Wainscoting wraps around the recently updated eat-in kitchen, which features a sizable pantry. Nestled in Oak Square, this petite brick building sits on a block of similarly adorable homes. Enter the one with the festive red front door to find this light and airy one-bedroom unit. It’s clean, simple, and bright, and offers proximity to several bus stops. Choosing an address in Boston means committing to one branch of the MBTA, but this one-bed’s Cleveland Circle location allows access to the B, C, and D trains. Not only is commuting a breeze, but the spacious interior makes coming home something to look forward to. Modern and clean, the unit’s sophistication is elevated by recessed lighting in the living area and directional lighting in the bedroom. Natural light pours through bay windows and bounces off of the refinished hardwood floors of this Brighton walk-up. The tiled bathroom comes complete with a pedestal sink and stylish subway tiling in the shower. Plentiful shelving and closet space throughout the unit are perfect for the clutter-phobe, and its main street location makes it easy to catch the T.
Midway between Packard’s Corner and Cleveland Circle, this cat-friendly unit grants tenants access to a roomy private balcony and communal swimming pool. A dishwasher, on-site laundry, and ample closet space are a few of the conveniences this apartment affords. Plus, being located right on Comm. Ave. means the B Line is just outside the door—putting downtown at your fingertips.